Our researcher Dimitrios Pantazis attended the 2016 Device Developers’ Conference (DDC), taken place on 27th & 28th of April in Cambourne, Cambridge. The UK DDC is a free 2-day conference, organised by Energi Technical Ltd. Its purpose is to present the most recent solutions in the areas of Embedded & Real-time Systems, such as advancements in software debugging, development tools and safety-related topics. The presentations of experts in the industry are accompanied by workshops and a vendor exhibition. This year’s conference was co-located with H/WExpo 2016, a conference on hardware development and validation, introducing innovative tools and techniques to facilitate the hardware production process. Dimitris also signed up for the half-day “JTAG practical workshop” organised by XJTAG. The workshop included a brief introduction to the JTAG technology, the principles of operation and the benefits it has to offer. A hands-on full board testing followed up, with each of the participants given the opportunity to perform a series of real-time tests on a custom board, such as GPIO, SPI and SRAM functionality tests. Melanie Zimmer, one of our cohort 2 researchers recently visited Merton Park Primary School. You can read about their day on the Merton Park Code Club blog here http://mppcodeclub.primaryblogger.co.uk/events/chromville/. Loughbrough University’s CDT-EI participated in the TriboUK 2016 conference held between 14th and 15th April 2016 in University of Leeds. Arturo Martinez-Insua-Rodriguez, Gajarajan Sivayogan, Rob Turnbull and Jamal Umer represented the group. 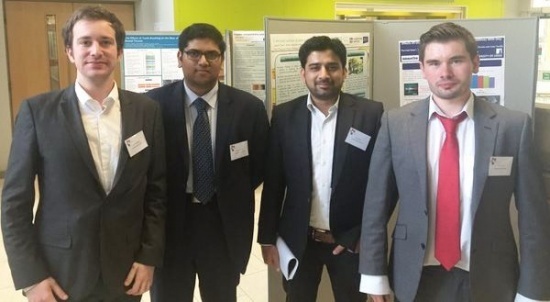 They were joined by the remaining members of the Loughbrough University’s Dynamic group Rickie Bewsher, Vishak Elisaus, Ehsan Fatourehchi and Theofilos Gkinis. The conference opened with Professor Margaret Stack, who is the head of the tribology research group at the University of Strathclyde. She gave an overview of the applications and projects related to the Tribo-Corrosion field, specifically projects related to Tidal Turbines. Arturo Martinez-Insua-Rodriguez and Jamal Umer presented posters during both days of the event, outlining their PhD projects. Rickie Bewsher showed a presentation of his project on the first day, while Ehsan Fatourehichi, Theofilos Gkinis and Rob Turnbull showed their presentation during the second day of the event. The group found the shorter ‘snap’ presentations was an interesting concept; it allowed the presenter to show a very quick overview of the project and findings in an understandable manner. The possibility of participating in these snap presentations for future conferences is being considered. Interesting work on the rail industry was shown by students and a keynote speaker Professor Roger Lewis from the University of Sheffield. The projects involved investigating the surface of railway lines and how different conditions give way to different tribological aspects. Professor Roger Lewis discussed finding global feasible methods in removing contaminants on railway lines. Many other PhD students representing different Universities asked questions to the CDT-EI group to get a better understanding of both Embedded Intelligent and the individual projects. Many members were interested in the process of how the Dynamic Group validated their findings. During the evening meal we were introduced to members of the IT-CDT group and got a further insight to Tribo-Corrosion. The second day keynote speaker was Professor Daniele Dini. He showed examples of how tribology was a highly inter-disciplinary subject and the vast applications it covers. He explained the tools developed and how final results have given a greater understanding to tribology. Many people were interested in the contact analysis of his work and the laboratory testing and simulations he presented. The conference was concluded by Professor Duncan Dowson, who gave a speech on how successful the TriboUK conference has been. He is proud at the commitment and the work going into Tribology. He further explained that tribology is one of the most interdisciplinary subject and great care and effort should be put into it. He presented the final awards and prizes, unfortunately the group did not win anything this year but they are committed in succeeding in future conferences. The DEN Webinar series got off to a flying start yesterday by having access to a live streaming of an expert Internet of Things (IoT) Foresight Lecture. For this year's annual guest lecture we welcomed Saverio Romeo, a Principal Analyst at Beecham Research, a leading technology market research, analysis and consultancy firm, recognised as IoT thought leaders, and established since 1991. 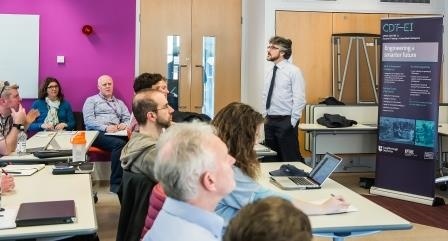 London-based Saverio focused his talk around the current status of the IoT vision, and the related opportunities and challenges, to an audience of circa 100 delegates, including a full seminar room at Loughborough University, and colleagues remote accessing during the live stream from Heriot-Watt University and other organisations across the world. Saverio shared expertise and insight on the evolution of IoT Platforms and the importance of Machine to Machine (M2M) solutions technology in the UK and the EU, as well as covering IoT policy, start-ups and cyber security issues, and identifying current and potential future global industry and SME key players in the sector. The Institution of Engineering and Technology New Challenges in Tribology. Robert Turnbull attended this year’s Institution of Engineering and Technology (IET) New Challenges in Tribology. A number of key note speakers attended the conference giving an insight to various industrial implications of tribology; automotive, rail, maritime and medical applications. This year marks the 50th anniversary of the ground breaking report “Lubrication Education and Research” commonly referred to as the Jost report. The Jost report outlined the substantial savings that can be obtained through the application of the principles of Tribology. Professor Jost, President of the International Tribology Counsel delivered a presentation on the day outlining tribology and productivity. Professor Jost is widely considered the founding father of tribology. It was an excellent opportunity to hear a talk from such a prolific member of the tribology community. Professor Dowson a member of the Jost working party on Tribology delivered a presentation on the application of Bio-Tribology. This talk was particularly interesting as the workings of the Human body are fascinating. The natural lubrication utilised by the Human body is not replicated in the rotating machinery designed by man. During the day a poster event was held with each candidate delivering a short 2 minute presentation on their research. A panel of judges interviewed each candidate and evaluated their posters with certificates awarded to the winners. At the end of the conference a discussion panel was held, with the opportunity to ask a panel of leading members of the tribology community questions. The day was a great opportunity to develop an understanding of the key areas of tribology and meet people in academia and industry. The facilities at the IET Birmingham Austin Court were excellent. David Czerski attended and presented a poster at this year’s IMAPS MicroTech 2016 conference on sensors, MEMS and advanced packaging hosted by Heriot-Watt University. Exhibitors at the conference included Filtronic, Optocap, Unisem, and Gen3 Systems among others displaying some of their test and assembly equipment. Academic exhibitors included The University of Edinburgh, Heriot-Watt University and the University of Strathclyde. The conferenced started with talks from industry, Semefab and Kelvin Nanotech discussing the companies’ initial set up, facilities and future developments. This section of the conference was finished by a talk from Prof. Marc Desmuilliez on development of a novel microwave curing oven. What followed was a discussion on engaging with industry, featuring academics from HWU and UCL, and industry representatives from Cirrus Logic and Finmeccanica. The group discussed challenges and benefits from academic and industry joint projects, covering areas of communication, timelines and IP. This was followed by a “30 second” presentation from each person presenting posters before the poster session started. 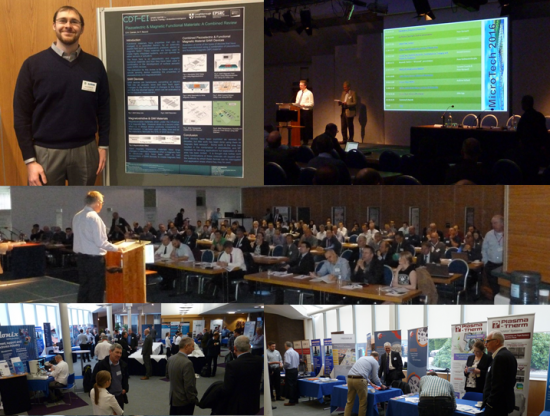 Posters where from Edinburgh, Strathclyde and Heriot-Watt Universities featuring a range of topics from thin films technologies to bio-inspired MEMS devices. Next were talks on MEMS. Systems Plus discussed how wearables are now driving demand for MEMS, pushing towards smaller, lower power consuming and low costs systems. Kiaim spoke of their transceiver technology combining MEMS with optical waveguides for hybrid circuits. And Cirrus Logic stressed how packaging is a fundamental part of the system design and not an afterthought. The final session on advanced packaging had Unisem tell us about packaging technologies for MEMS products and the technologies that have become a standard in the industry. Andrew Holland replaced one of the programme’s speakers who could not make it, and we learnt of the “Bean IoT” sensor that he is developing and hoping to have on the market in the next year. A low power sensor the size and shape of bean, carrying a number of sensors including temperature, gyroscope, CO2, with wireless charging. METBS then spoke of packaging requirements for high reliability applications, medical sector, defence and aerospace. The MircoTech conference was a great opportunity to learn about current developments and challenges in the semiconductor and microelectronic assembly and packaging industry. Offering a chance to meet with industry and academics in the area and hear their concerns and thoughts on opportunities for the future of the sector. When I signed up for “I’m an Engineer – Get me out of here!” (IAEGMOOH), I did not know what I was getting myself into. IAEGMOOH is a free two-week online event where school students get the chance to interact with engineers in an X-Factor style competition. During these two weeks students can ask questions in several 30 minutes live chats or in a forum. Engineers register for this event by giving a one sentence summary of their work in as simple and fun terms as possible. I was very happy when I got invited to participate in the March edition of IAEGMOOH this year. In this edition, nearly 50 schools interacted with 25 engineers across 5 different zones on topics such as food, fuel, metre, surgery and robotics. I got chosen for the Robotics Zone to compete against engineers working on underwater robots, robots for the food industry and even Europe’s first Mars Rover! Based on the live chats and responses to questions asked in the forum, the students would vote for their favourite engineer to win a prize of £500. The votes were collected throughout the duration of the event and each day during the second week, the engineer with the least votes got evicted. It was indeed a nerve-racking X-Factor moment as the names of those leaving the process were announced during live chats! The winning engineer of each zone will have to spend the prize money on activities to publicly promote engineering. Although I did not win the competition, I survived the evictions and made it to the finals! These two weeks have been so much fun – but also challenging! In most of the live chats we were constantly bombarded with all sorts of questions ranging from “What is your favourite food?”, “What is the best thing about your job?” to “If robots more intelligent than humans are created, will they be able to create robots more intelligent than themselves?” and “Does being a female effect the way you’re treated being a scientist?”. Overall, it was amazing to see how interested students were in robotics! I think it is fantastic that IAEGMOOH gives students the chance to ask questions they normally would not ask or could not get answered that easily. I hope that these two weeks have been inspiring to the students and will possibly have an ongoing impact on their career by giving them an idea of how versatile engineering can be. IAEGMOOH was also a great learning experience for me. I got to know what students are interested in (it is not just One Direction) and how to communicate my research to year 5 to 12 students. The most rewarding for me, however, was to see how students connected with us engineers. What does the Carolan guitar, waste water, petrol tankers and meteorology have in common? The LATi Expert Exchange on ‘Connecting to the Internet of Things’ gave an exciting glimpse into the future of IoT, and the diverse and interesting applications that the technology is being used for. The LATi Expert Exchange, which was held at the Advanced Technology Innovation Centre (ATIC) at Loughborough University Science and Enterprise Park on 17 March, brought together scientists, engineers and technologists interested in how they can exploit this new technology. Kicking off the presentations was Professor Steve Benford from the University of Nottingham. Steve introduced a new technology called Artcodes, which allows information about an object to be embedded in digital codes. This was demonstrated with the Carolan guitar featuring Celtic inspired decorative patterns. When scanned using the Artcodes app each decorative pattern will tell a different story; the history of making the guitar, playsets and stories from its ‘owners’, overall creating a digital footprint for the object. Other applications for this technology include wallpaper, homes, cars and even wargaming miniatures. Three companies followed Steve’s presentation, Martin Croft from Dynamic Flow technologies Ltd, Michael Belcher from Datalink Electronics and Simon Massey, Campbell Scientific Europe. Each gave insight into their recent developments and current thoughts about increasing connectivity between products and systems. Martin Croft and Michael Belcher gave demonstrations of recent technology developments. Martin spoke about the waste water sensing and the technology they have developed, which is in use today by some water companies. Martin also showed a portable mini Infrared sensor (SCiO Lab) that uses a smartphone app to show present the results ‘molecular fingerprint’. This was an example of where they could go next. Dynamic Flow Technologies Ltd is working with Loughborough University to explore new development opportunities. Michael spoke intelligent petrol tank refuelling and described how the final product evolved to meet the needs of the end user. He demonstrated wireless sensor nodes and described how the ‘intelligence’ in sensor networks (such as home energy apps) is in the ability to learn from historic data. Simon provided an overview of how Campbell Scientific’s products have evolved to meet end-user requirements. They are seeing an increasing desire from the end-users to provide meaningful data on demand, and this has allowed Campbell Scientific to develop data management software and mobile apps such as LoggerLink to present the data in desired formats when required. Overall this expert exchange provided a good platform for individuals in the space to hear what the internet of things means to companies, how it is being used and to discuss some of the opportunities and challenges being faced.